Charles de Gaulle once stated, 'France has no friends, only interests,' and it was this strength of mind and love of country that took France from an occupied territory during WWII to a leader in the Allied cause. Michael Haskew takes us on a journey to understand the man who rem... read full description below. Charles de Gaulle once stated, France has no friends, only interests, and it was this strength of mind and love of country that took the region from an occupied territory during World War II to a leader in the Allied cause. 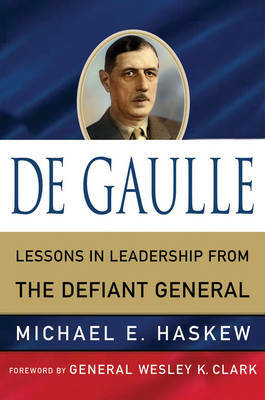 Convinced that his personal destiny and that of his beloved country were intertwined, de Gaulle's life's work was dedicated to advancing its preeminence among nations. Even while the country lay prostrate before the Nazis, he maintained the honor of the French people, choosing to resist rather than to collaborate. His presidency was no less visionary; under de Gaulle, France became a nuclear power, granted autonomy to more than a dozen of its former colonial holdings, and maintained an influential presence on the world stage. Here, Michael Haskew takes us on a tremendous journey through de Gaulle's pivotal years, his leadership of the resistance, and beyond to understand the man who remade both modern military tactics and global leadership. MICHAEL HASKEW Editor of WWII History Magazine and the former editor of World War II Magazine. He is the author of a number of books, including The Sniper at War and Order of Battle. Haskew is also the editor of The World War II Desk Reference with the Eisenhower Center for American Studies. He lives in Hixson, Tennessee, USA.